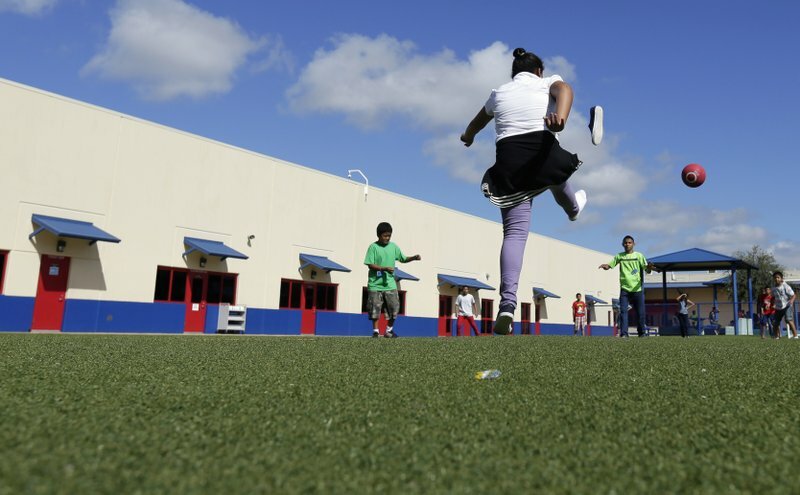 AUSTIN, Texas (AP) — A top private prison company is struggling to convince Texas lawmakers to license one of its facilities to hold immigrant parents and their children together — a practice that President Donald Trump’s administration recently committed to upholding. The Karnes Residential Center, 60 miles south of San Antonio, opened as a family detention center in 2014 and used to hold detainees for months, until a federal judge ruled that children held longer than 20 days must be housed in “non-secure” facilities with child care licenses. After the Texas Department of Family Protective Services granted Karnes a license, advocates sued, saying that holding children in detention causes psychological and physical harm. A state judge ruled last year that family detention centers did not qualify for licenses. Now legislators are considering easing requirements for child care facilities, but opponents say the bill would license the centers without improving conditions. Attorneys have warned that it could invite a costly lawsuit. A state representative who introduced the measure acknowledged that the proposed legislation came directly from GEO Group, the nation’s second-largest private prison company, which operates Karnes. Earlier this month, Homeland Security Secretary John Kelly said parents and children caught crossing the Mexican border would generally be allowed to stay together. His comment to a Senate committee contrasted with earlier pronouncements that his agency was considering separating families as a deterrent to would-be border crossers, mostly from Central America. Kelly said families caught crossing the border illegally generally would not be separated unless the “situation at the time requires it.” He gave as examples the mother being sick or addicted to drugs. But he said separation would not be routine. Immigration advocates say holding families in detention — a practice adopted by the Obama administration in its own effort to deter border crossers — is just as harmful and that families seeking asylum should be released to pursue their legal cases. Thirty-three people testified against Raney’s bill when it was heard in committee, including pediatricians and psychologists. A similar bill is pending in a Senate committee. Despite GEO’s lobbying, neither version of the child care licensing bill appears likely to pass. “There were a lot of questions that need to be answered,” said Republican state Rep. Byron Cook, chairman of the House Committee on State Affairs, which will have to approve the bill before it can reach the House floor. GEO Group’s political action committee has spent up to $320,000 lobbying the Texas Legislature since January and contributed $193,000 to Texas lawmakers’ campaigns since 2013, according to Texans for Public Justice, a left-leaning political watchdog group that compiled its findings using Texas Ethics Commission filings. GEO has multiple lockups in Texas, including one announced last week that will be the first new immigrant detention center under the Trump administration. Because lawmakers have been considering several measures related to private prisons, it’s hard to say how much of the money was directed specifically toward immigration detention matters. In an emailed statement, GEO disputed the group’s findings. Based in Boca Raton, Florida, GEO earns about $55 million annually from Karnes, its only family facility. Karnes’ population has plummeted to about 100 in the 830-bed facility. The state’s other family facility, the 2,400-bed South Texas Residential Center, is run by CoreCivic, America’s largest private prison operator. Its population has dropped to about 200. A CoreCivic spokesman said his company has not been involved with the bills and takes no position on them. Both centers are operating below capacity because the flow of women and children fleeing gangs and violence in Central America to seek asylum in the U.S. has slowed dramatically. The number of overall illegal border-crossers detained nationally has fallen since the presidential election, but federal authorities have also begun detaining more adults who are already in the country illegally. That has made adult detention centers more full than those housing families.